Flying Halloween Skull – Update! Last year, I put together a skull to fly around my yard (some Halloween folks will recognize this system as an “Axworthy Flying Ghost“). 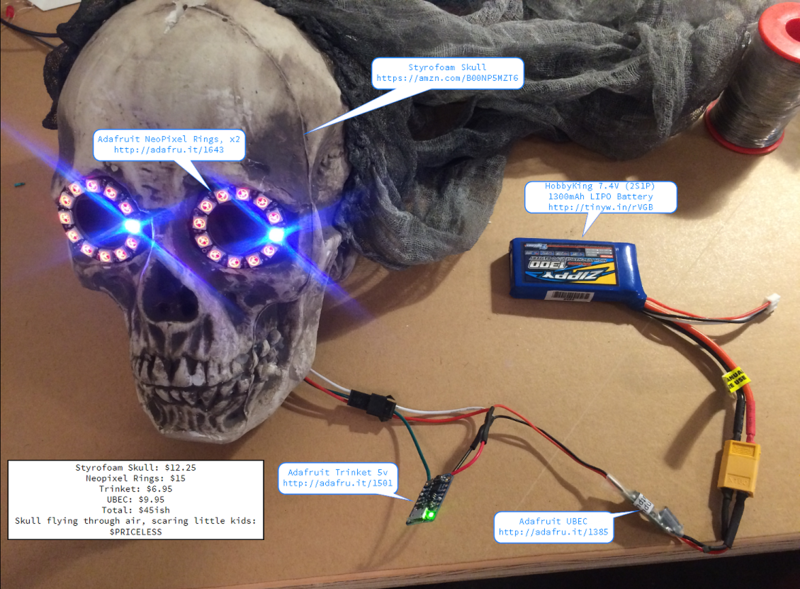 The system was comprised of two Adafruit Neopixel rings for eyes, attached to a styrofoam skull, which had been hollowed out. Inside it, was an Arduino Uno, Adafruit AudioFX board, a 314mhz receiver, a 3-watt Class-D amplifier, a custom-made interface board which tied all the previously-listed components together, and a LIPO battery. The idea was that I could remotely trigger the skull to play one of four sound effects. However, all those parts sure weighed a lot, which when combined with the span between my pulleys, really made the skull sag down low. This year, I decided to KISS. I ripped out all the guts, except for the Neopixel eyes. I decided that this year, I’m not going to have sound in the skull. Instead of the Uno, I went with an Adafruit Trinket, and used a UBEC (Universal Battery Eliminator Circuit) to drop the LIPO voltage from 7.4V -> 5V that the Trinket and Neopixels run at. Shown below is how everything is connected together, prices, and sources if you’d like to make your own! And here’s a video of what the eyes look like (sorry about the VVS!! )!